​Through generous support from Safari Club International Foundation, we have initiated an innovative multi-state research project to assess bobcat populations, likely the largest research project ever undertaken for this furbearing species! Pelt prices for bobcats harvested in many areas of the western U.S. have been very high in recent years. This has led to increased hunter and trapper participation and effort, and therefore, increased overall harvest (see AFWA National Furbearer Harvest Statistics Database). Bobcat populations in the U.S. have also putatively increased in abundance and distribution in recent decades, although no population modeling efforts have been used to date quantify these increases. Many state wildlife agencies collect harvest data from hunters and trappers, including for meeting requirements associated with the Convention on International Trade in Endangered Species of Wild Fauna and Flora (CITES). However, many agencies have yet to take full advantage of analyzing these data, especially to conduct accurate assessments of abundance and trends in bobcat populations and effects of harvest on populations. This lack of population modeling makes it difficult to accurately quantify population trends, and consequently, difficult to make informed and defensible management decisions. These knowledge gaps leave state agencies vulnerable to increasing challenges to management decisions and authority under the North American Model of Wildlife Conservation. 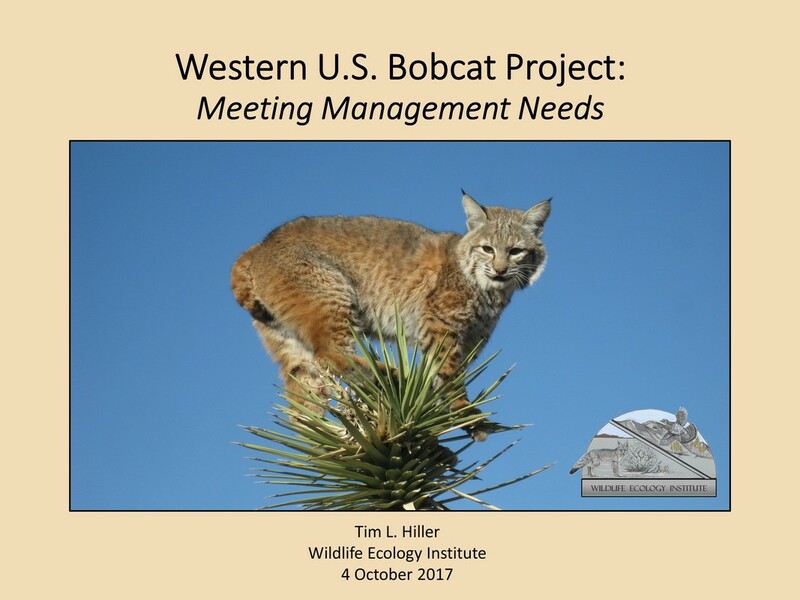 Many western state agencies are well positioned to address these concerns in that they already collect the data necessary to reconstruct bobcat populations and estimate abundance, long-term trends, and effects of harvest. Wildlife Ecology Institute is working directly with state wildlife agencies to use bobcat harvest (and other) data to assess bobcat populations and harvest through this substantial multi-state effort. Bobcats serve as an ideal example for a multi-state approach that fully utilizes available data and contemporary analytical methods for estimating populations, and therefore uses the best available science for decision making. State agencies can directly use our results to support informed and defensible management decisions and provide a solid foundation on which to respond to any challenges. If you are with a state agency outside of the western U.S., please Contact Us about potential inclusion in this project. We can readily address your needs as well!